Good points. I think it is quite likely Joy's rug is from that larger matrix. In fact, I take the distinction between 'thin rugs with thin yarn' and 'thick rugs with thick yarn' to be a reference to, on the one hand, the Kuba-Shirvan-Derbent (the last being a bit of a middle player) group; and on the other, the Kazak-Gendje-Karabagh group. BTW, since we are flogging Joy's rug all over the Caucasus, we might as well plead Karabagh influence off that border. And here, of course, is where it shows what an ignoramus I am about these things. We can't have that. My fault for asking the thin/thick question. My favorite mantra about rugs is, nobody really knows anything about them, and we do not want to appear that we think we know all the answers. Meanwhile, your rug has so far provided (me!) a lot of entertainment. Anyway, I would not suggest that you attempt to compare your rug with other non-Caucasian pieces with regard to thinness, etc. Perhaps you have some sense of the two broad groupings I suggested just above. The reason I lit up at your post of this rug was first, that it is a pretty one in very nice shape; and second, that it has a number of more than usually interesting features, including the size (for a prayer rug) and of course the numbers. One can go out and find many Caucasians floating around, and unfortunately, a lot of them are ugly with bad colors. You have a nice one. Oh my Rich. Your note just brought as big a smile to me as the game just finished between Belgium and Japan. Wow, if I may say so. So, you are not just a pretty face! Did you ever have the pleasure of comparing Russian notes with Richard Wright? He was prominently in view at Textile Museum affairs a good number of years ago, as I recall. "The Tiflis dealers divided the carpets of the Transcaucasus – the source of the vast majority of exported carpets -- into three broad categories. 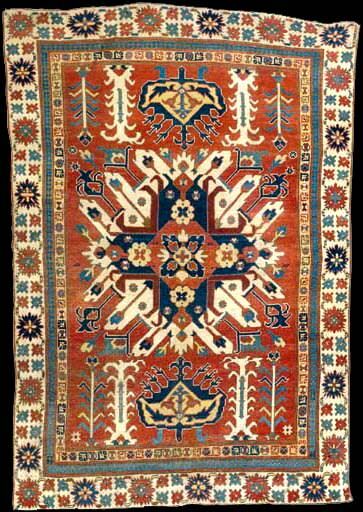 Western region: Kazak and Ganja rugs with bold geometric patterns, thick wool, and high piles. Eastern region: Kuba, Baku, and Shirvan rugs with minute motifs, fine wool, and low piles. Southern region: Karabagh, Moghan and Talish rugs. There was an underlying genius to the system, because these categories to some extent mirror the different climates of the Transcaucasus region. The west has a harsh climate where thick carpets are desirable for insulation from the cold ground. The thick yarn and long piles needed for that, in turn, allow only the weaving of large and rectilinear geometric motifs. The east has milder climate, particularly along the Caspian Sea, allowing carpets to be more decorative. The weavers could use thinner yarn, and that allows a higher knot density and more intricate designs." "That same ornamental influence can be seen in the weavings of Karabagh, in the south. There, where rugs were woven by Armenians, Azeris, and Kurds, the designs are more ornate, frequently have floral motifs, and are more decorative than in other parts of the Caucasus." So there must be some elements in the rug that have Armenian influence that the writer of the note could see. You have been very helpful and enthusiastic, for which I thank you, and I'm glad it's given you some entertainment! Maybe in time, a specialist in Caucasian little prayer rugs can enlighten us all on its source and influences. No, I'm not just another pretty face - I can type. I never chatted with Wright. Languages come to me very easily and nothing embarrasses me so I don't worry about making mistakes on the streets. At one time or another I've been comfortable with Russian, German, French, Turkish and Japanese. The most important phrases to learn in Russian are: "Nekogda ne sprashyvaetye mne, ya ne snaio nichevo" (Never ask me anything, I don't know nothing), and "Ya budu piit shampanskaya" (I will drink champagne). "Gdye toilette?" (Where is the toilet?) can be handy, too. From Ken: "I think it is rare to have the harshang border on a prayer rug. This type of border is more associated with the Karabakh region. I am unfamiliar with the inner border pattern. The 3 cord naturally colored selvedge also reminds me of Kuba rugs from the 1920's." Now, after days of scouring through all my books and hundreds of pictures online, I remembered your note way back and I think you're right in your opinion. The rug is a bit of this and a bit of that, (which I understand most Caucasians are) but the border on the Karabagh rug from Chelaberd shown on page 150 of Ian Bennett's Oriental Rugs and Carpets, and on the Karabagh rug on page 151, are exactly the same as on mine. And, staying with Ian Bennett, the Kuba rug from Chichi has very similar 'shields' in the field as mine, although mine aren't as detailed. To be honest, I don't know whether these are called shields, so someone please tell me the correct name. I ask, because on page 157 under Rugs of Daghestan and Lesghistan "...... are some magnificent pieces with rows of shield medallions containing heraldic-like devices which are, in fact stylized flowers." They could also be 'palmettes' I think they're called. What I don't have is a book/dictionary/encyclopedia that could teach me the nomenclature of all the symbols and designs, but I don't know if we're allowed to recommend on the site? Wesley Marquand has suggested Peter Stone's Tribal and Village Rugs - The Definitive Guide to Design Pattern and Motif and I also wondered about The Oriental Carpet: A History and Guide to Traditional Motifs, Patterns and Symbols by Ford. Just to further the addiction. If we're not allowed, my apologies Steve and Filiberto. Yes, very often the design of Caucasians borrows elements from other Caucasian groups, so we have to look at the structure. In your case, it’s the selvedge - as Ken says - that points to an Eastern, probably Kuba, origin. By the way, what about the knot density in your rug? I don’t remember why those elements are called shield or palmettes (I am not home and I cannot check my books). It’s absolutely OK to discuss about rug-books on Turkotek. Of the ones you mention: both are valid and you should have them but Stone’s is the one you need if you look for nomenclature of symbols and designs and associations with the weaving group that used them. I agree with everything Filiberto said. I would add that any book by Jim Ford is well worth a perusal. He stands out among rug authors when it comes to putting out reliable information. About the nomenclature for design elements in Caucasian rugs, although I am sure there is plenty of it, I do not believe there are generally accepted lists of vocabulary items such as you might find for Turkoman rugs. I do not intend to dissuade you from pursuing this line, but you will probably not find the equivalent of, say, the names of guls. Dyrnak gul, kepse gul, etc. These last are widely accepted items of Turkoman jargon. Now, after days of scouring through all my books and hundreds of pictures online, I remembered your note way back and I think you're right in your opinion. The rug is a bit of this and a bit of that, (which I understand most Caucasians are) but the border on the Karabagh rug from Chelaberd shown on page 150 of Ian Bennett's Oriental Rugs and Carpets, and on the Karabagh rug on page 151, are exactly the same as on mine. This (Crab) border is probably the most common style from that region. And, staying with Ian Bennett, the Kuba rug from Chichi has very similar 'shields' in the field as mine, although mine aren't as detailed. To be honest, I don't know whether these are called shields, so someone please tell me the correct name. I ask, because on page 157 under Rugs of Daghestan and Lesghistan "...... are some magnificent pieces with rows of shield medallions containing heraldic-like devices which are, in fact stylized flowers." They could also be 'palmettes' I think they're called. These shields were palmettes or stylised flowers in earlier renditions. The curvilinear designs eventually became more geometric and the palmettes/flowers began to look like shields. Thank you Filiberto, Rich and Ken. You're all such good patient teachers. Now at least I know the name of one of these borders! I have ordered the Stone, and went out to look for it first but came back with Sotheby's Guide to Oriental Carpets and Krody's Flowers of Silk and Gold from the Textile Museum instead. I hope you all don't mind my breathless excitement, but I'm just a beginner, and you probably all remember how it was when you first became afflicted with this bug. I made my first attempt to count the knots on this little prayer rug, following the instructions I found online - and know for sure it's 16 knots horizontally, because they're easier to count, but being more difficult going down, I'm not sure whether it's 16 or up to 19, so between 256 and 304 kpsi. Is that any help in locating where it may have been woven? Schurmann's [I]Caucasian Rugs[I] was just dropped off by mailman. It has what looks like a hole from the third page in that goes through almost 200 pages. Everything is legible, but my better half thinks it looks like bullet hole. He's Bulgarian, and not a romantic, so who knows where it's been. If he's Bulgarian and thinks it's a bullet hole, I'd go with that. Sounds like somebody got shot while reading it. Is the exit hole on the back cover or on page 3? The hole is on the third page in. Is that a wild guess or is it something you already know?! The last page with an actual cut in the paper is 128, the picture of a Kasim Ushag Karabagh. The very last page of the book, however, shows the pressure of whatever caused the damage. The hard cover, both front and back, is untouched. I made my first attempt to count the knots on this little prayer rug, following the instructions I found online - and know for sure it's 16 knots horizontally, because they're easier to count, but being more difficult going down, I'm not sure whether it's 16 or up to 19, so between 256 and 304 kpsi. Keep in mind when you are counting knots that each knot goes around two warps to form two nodules or lumps on the back. So, when you are counting horizontally, in general the number of knots is half the number of nodules. I say 'in general' because in some weaves where the warp is severely depressed, only one of the two nodules is visible on the back. With more moderate warp depression, both are visible but one only partially. If you'd post a close-up of the back of your rug with a coin or ruler for scale, we can all count along with you. I knew the hole began or ended on page three because you said it went from the third page on in. From your description, page 3 has the entrance hole and it never exited. There is a second variation to the crab border which is more ornate that in most likelihood begat the type found on yours. Last edited by Ken Shum; July 12th, 2018 at 08:31 PM. Yes, thank you Ken. I'm learning how important borders (and selvedges) are in the search for a source. It seems that deconstructing Caucasian rugs is more difficult than Persian, Turkomen, Afghan and Anatolian. The ruggedness of their landscape maybe. I hope to evolve to a point where I'm asking less tedious questions! Not a prayer rug, but may be Caucasian, so keeping on this thread. I rescued this from an attic in an old house because I like it, but any ideas? The US quarter is used because its diameter is an approximation to an inch (0.95 inches is pretty close) and Americans are likely to have one handy. My calipers never seem to be in my pocket when I need them most. That's more of a Canadian thing, eh? My shoes are close enough to 12 inches long that I use them to approximate the dimensions of rugs and carpets and floors, and am accurate to within an inch or two on 10 feet. By my count, your prayer rug is 9 horizontal knots/inch by 9 vertical knots/inch or 81kpsi.